A decent start for Sony's audio editor on Mac, though PC veterans may be disappointed at the missing features. Slick, efficient interface. Excellent iZotope processing package. Flexible editing and processing options. Problem-free for a new build. iZotope plugins not multichannel-compatible. No CD mastering or batch conversion. Limited analysis tools. Sound Forge, a powerful audio editor, is one of Sony's most successful PC applications - now at version 10, it's absolutely packed with features. However, rather than try and port it to OS X, Sound Forge Pro Mac 1.0 is a whole new build from the ground up. "There are a lot of minor functional and interface differences between Sound Forge Pro Mac and its PC sibling, but the essence of the application is certainly there"
Indeed, it only supports OS X 10.7 and later, the price point is lower, and within minutes of launching it, you realise that it's a much simpler product. There are a lot of minor functional and interface differences between Sound Forge Pro Mac and its PC sibling, but the biggest omissions are CD mastering, batch conversion, video support, spectrum analysis and phase meters. However, the essence of the application is certainly there, as are a powerful set of bundled iZotope plug-ins, including their Mastering and Repair Suite, MBIT+ Dither and 64-bit SRC (sample rate conversion). Plus, there's zplane élastique timestretching and pitchshifting, access to all of Apple's own AU plug ins, and AU/VST support. 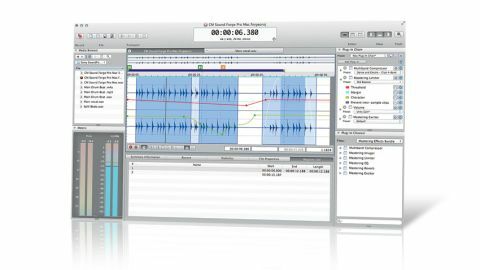 Sound Forge Pro Mac operates in essentially the same way as the latest Windows version. Two tiers of functionality are available: you can either record, chop, copy, edit and process files in the standard non-destructive way (with full undo/redo), eventually saving all changes to a new file. Or you can use the new event-based editing system, which lets you cut up and rearrange audio files, rather like you would on an audio track in a DAW. Once again, saving renders a new file. For processing audio, 13 of the included processors (including timestretch, sample rate conversion and channel conversion) can only be used offline as 'one-shot' processes. The remaining 26 processors (including the iZotope ones) can be combined in plugin chains (along with VST/AU plugins) and can have parameters automated over the duration of the file. "Sound Forge Pro Mac stores all your active edits, so you can quit the software at any time without committing to any changes in your audio file, then return to it later"
Sound Forge Pro Mac uses a project file system that stores all your active edits, so you can quit the software at any time without committing to any changes in your audio file, then return to it later. The interface is similar to the PC version, but simpler and a bit slicker. The file editor sits in the middle flanked by three further panes (left, right and bottom). You can fold these in and out with the view control (top right), and populate them with whatever combination of Sound Forge's nine tools you like. We found a preference for having the meters and browser on the left, the plugin chain and browser to the right, and the remainder at the bottom (where they become tabbed pages). You can view two files in the file editor at any one time, and any further opened files become tabbed pages in whichever editor is selected. "The processing is great - we were particularly impressed by the accuracy and speed of zplane's timestretch algorithm"
It all works very well indeed, making most basic file editing tasks very easy to complete. And the processing is great - we were particularly impressed by the accuracy and speed of zplane's timestretch algorithm. However, this is clearly a much simpler application (in terms of layout/design) than the PC one, so whether it could cope with the weight of more features is unclear. What's more, the lack of CD mastering and batch conversion is frustrating - if you're a PC Soundforge user who expects these features, this could be a deal-breaker. Let's hope they appear in later updates. Even so, Sound Forge Pro Mac is a promising first outing.